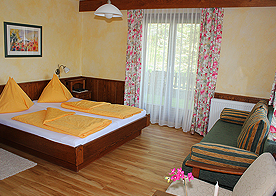 The guest house Regenbogen in St. Georgen am Attersee offers peace and tranquility in the countryside. Our house has a covered terrace, sauna and 14 spacious luxury rooms for 2 to 5 people. The Attersee and the Salzkammergut offer a wide range of sports and recreational facilities. 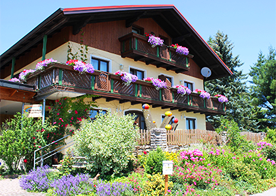 The guest house pension Regenbogen in St. Georgen im Attergau is the ideal home for bathing, hiking and relaxing holiday in the beautiful Salzkammergut. Our house is located in a beautiful quiet location and offers everything for a vacationer's heart. The spacious rooms are equipped with shower/WC, direct dial telephone, radio, flat screen TV (satellite), a safe and a balcony or terrace. There are also a gym, a games room with library, a cozy covered terrace, a landscaped south-facing conservatory, a sauna and a playground. The palate we spoil among other things with a morning breakfast buffet. Our pension is located 8 km away from Lake Attersee in a beautiful green location in St. Georgen/Hipping. 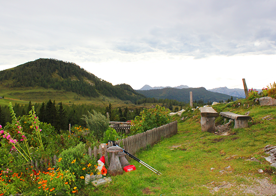 The hills in the Attergau are a feast for the eyes and offers a variety of interesting walks and themed routes. These include the Celtic.Tree.Path with different sensory stations, the glass valley with the Schaudorf Freudenthal and the Attergauer observation tower at Lichtenberg, who offers a wonderful overview of the Salzkammergut in all directions. Our guesthouse is located at Römerradweg and is therefore the ideal hostel for all long-distance cyclists. Located near the German border, make cyclists happy with us your first stop in Austria. Our guesthouse has 14 rooms in 4 different categories. We have five double rooms, six triples and two four-bed rooms with balcony or terrace and a family apartment for 5 people (one double bed and one triple bed) with a balcony. Find out more about rooms and rates.